Equipped with the safety and security of HobbyZone’s exclusive Anti-Crash Technology (ACT™), the Mini Super Cub ensures smooth and steady flying right from the start. This smaller version of the HobbyZone classic Super Cub offers true scale-flying thrills with 3-channel control, making it a perfect introduction to the world of RC flight. Anti-Crash Technology™ utilizes optical sensors and software that constantly monitor the Mini Super Cub’s position. If your Mini Super Cub enters a dangerous dive, the software reacts quickly to help prevent a crash while allowing you to regain control. ACT also gives you two ways to fly – engaged or disengaged. When it’s on, the computer automatically analyzes your Mini Super Cub’s flight path to keep it from experiencing precarious drops. After mastering the basics with ACT on, press the control stick on the transmitter (even while in flight) to turn it off. When it’s disengaged, the plane is capable of more advanced maneuvers, like loops, rolls and spins. 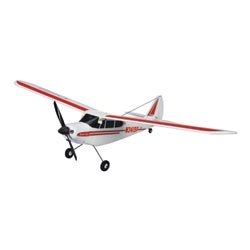 HobbyZone’s Mini Super Cub makes it safe, simple and fun for almost anyone to learn the basics of RC flight. By combining throttle, steering and pitch controls with Anti-Crash Technology and an instantly recognizable scale design, it is the ideal choice for starting your RC adventure. Everything you need to begin is right here in the box, meaning you are only minutes away from a truly authentic flight experience you’ll never forget.